The Wolverhampton Society of Artists 2017 Exhibition at Wolverhampton Art Gallery has now closed and we can take time to reflect. Our thanks go to Carol Thompson and the gallery staff for their support throughout the exhibition. We are agreed that the exhibition was a big success. We drew in a notable number of public visitors and, as in previous years, they left an eclectic mix of comments most of which I am pleased to say, were positively charged. In all eleven art works were sold. The People’s Choice award was organised by the gallery and engaged visitors in a positive and interactive way. This coincided with the President’s Choice and both awards were presented on the final demonstration day of the exhibition. This year the society introduced a new award - the Elsie Holland prize of £100. This award has been donated anonymously to the society and will continue every year both to honour the memory of a remarkable lady and recognise her contribution to the visual arts in Wolverhampton. With regard to this new award we have some marvellous news. We have just heard that the winner of our first Elsie Holland Prize Linda Nevill has been shortlisted for an Artist and Illustrator's Artist of the Year 2018 Award with her etching 'Homed and Homeless'. It will be featured in an on-line exhibition and also an exhibition with other shortlisted artists at the Mall Galleries in London in February 2018. And she almost didn’t enter! Congratulations Linda. We can support Linda by voting for ‘Homed & Homeless’ in an online People's Prize competition. We shall post and email the website details for this asap. Another first this year was the Open Studio initiative which was part of our programme of events and it proved to be very popular. Positive feedback and recommendations from participants has been noted for future events. Thank you to those who did the demonstrations and also to members of the society and friends and family for supporting each event. Much goes on behind the scenes of course, so my thanks also go to those who volunteered to help on handing in and selection days. Finally, a huge thank you to our exhibition secretary, Julia Timmins, whose superb administrations both preceding and throughout the exhibition, ensured yet another successful exhibition for the society. Collection day was on Wednesday the 22nd of November; thank you to all those who volunteered to help with this. Looking forward to doing it all again in 2018. On Saturday 23rd of September we opened our exhibition at Wolverhampton Art Gallery to a room already buzzing with interest. Our guest speakers, Margaret Jarvis, an immediate past president and life honorary member of the society, and our official guest, artist Wayne Attwood, Vice President of the RBSA, gave us marvellous speeches which both inspired and entertained us. Wayne told us of his extraordinary sailing adventures which eventually steered him toward a professional career as an artist. We were inspired by his passion and dedication to the pursuit of excellence in his work. 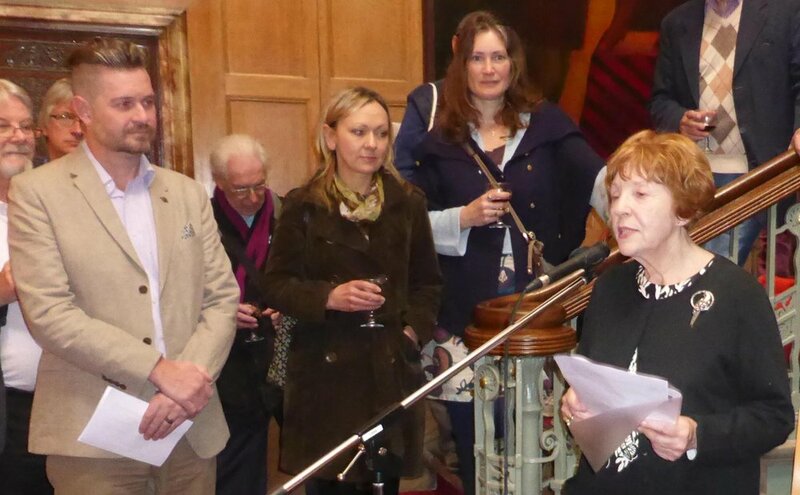 Margaret acknowledged the contribution everyone had made towards the exhibition, in particular those artists whose work was declined, ensuring that the occasion was not simply a celebration of success for the few, but a celebration of the endeavour and commitment of everyone who participated. The society is thrilled and honoured to be giving a new award this year. At the request of an anonymous donor the newly created Elsie Holland Prize of £100 will be awarded each year for outstanding work in any medium. Elsie Holland was a remarkable woman who devoted herself to adult education in Wolverhampton. Inspired by her socialist principles she was especially keen on Art and the ways in which it can enrich people's lives. We had a lovely opening. The atmosphere was friendly and informal and we look forward to Saturday the 30th September when our President Keith Oram will give his Exhibition review at 11.30am. Victor Hayward was awarded the Curators Choice Prize – Highly Commended for his pastel work in this exhibition “Taking a Break”. Ed sketched people and scenes within the gallery and passed on tips and ideas to anyone who was interested to find out more about the growing urban sketching art movement. This was a great opportunity to see and be inspired by a selection of Ed's wonderful sketches and sketch pads and everyone was encouraged to get involved and bring along sketch pads and pens and have a go for themselves. All visitors were given a ticket and entered into a prize draw to win one of Ed’s sketches the lucky winner was Charlotte Nock. The Wolverhampton Society of Artists is proud to present its latest collection of members work in a new biennial Exhibition at Wolverhampton Art Gallery. The Exhibition was opened on October 24th by Jonnie Turpie, High Sheriff of the West Midlands. Jonnie is a businessman, founder and director of Maverick TV and has a keen interest in art. with the Selectors’ Choice and Gallery Staff Choice going to Mark Whitehouse for ‘Into the Mystic’. Following the success of the Society’s current exhibition at Nuneaton, the opening of which was attended by Gurkha Captain Pun, the Society was pleased to welcome a group of new Gurkha recruits to the Biennial opening as part of their Introduction to Western Cultures Tour. The Exhibition gives both professional and amateur members a chance to showcase new work and provides an opportunity for the visiting public to purchase original works of art. Throughout the Exhibition, various artists will demonstrate the diverse range of styles and subject matter which has become the signature of this long established Society. There followed a presentation of two framed panoramic photographs of areas of Nepal which were destroyed in the recent earthquake. These unique photographs were discovered by WSA member and keen photographer Fred Lowe in a closing down shop in Wales and Margaret Jarvis had them framed. They considered it appropriate that the photographs be donated to the Gurkha regiment in Nuneaton. The photographs were presented by Margaret, an honorary life member of the Wolverhampton Society of Artists, on behalf of the society, to Captain Pun, a war hero of the Queen’s Gurkha Signals. Individual members of the society made personal donations to the Nepalese disaster fund and the Ghurkha support fund. On a day of bright, warm sunshine our exhibition in Nuneaton opened. The whole event was, like the day, warm and friendly. Hopefully we have made new friends in the town of Nuneaton. Certainly everyone I spoke to was impressed with our art work. This year is a special one for the Society. We will have two exhibitions in public art galleries in the Midlands. Our biennial exhibition at Wolverhampton Art Gallery and one at Nuneaton Art Gallery. It is an opportunity for the Society to reach out to a much wider audience. It is also an opportunity reach out to make new friends and introduce ourselves to new potential members as well as the public at large. Being seen by a wider audience is an important part of growing the Society and developing new outlets for the work of our members. We have had close ties with the Wolverhampton Art Gallery since its founding in 1885 and are proud to be still exhibiting in the Gallery. Members are invited to submit two works for selection and those accepted are hung in the exhibition. This event enjoys an excellent attendance. We encourage a ”meet the people” approach during the exhibition with demonstrations and “have a go” opportunities for the public.